The British arrived on May 26 and savagely handled a group of farmers and slaves on the outskirts of town before rushing into the deadly volleys from the entrenched defenders. The militia and natives, unused to attacking fortifications, faltered. (Classic native and French Canadian warfare, known in French as la petite guerre, involved lightning raids against lightly or undefended targets). De Leyba's cannon on Fort San Carlos opened fire, driving the invaders off. The village of 900 lost 92 dead and captured, virtually all civilians. 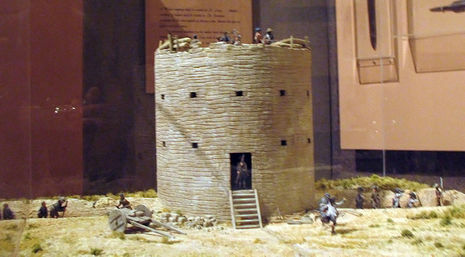 The British met a similar defeat at Cahokia, and a year later the Spaniards from St. Louis seized Fort St. Joseph. With its position rendered untenable by the Siege of Yorktown, Britain entered peace negotiations in 1782. 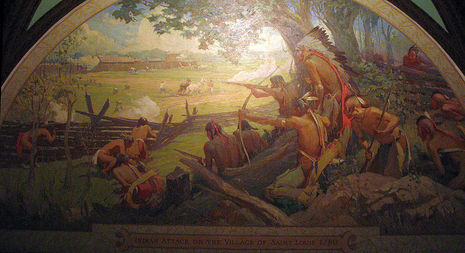 East of St. Louis, 300 Indians went with pro-British Frenchman, Jean Marie Ducharme (was a former St. Louisan) to attack Cahokia, while rest of command went with Hesse to attack St. Louis. Crossing north of the city, Hesse's forces encountered two unfortunate St. Louisans (at present day Fairgrounds Park). One man was killed and other captured. Many St. Louisans were out picking strawberries when the Indians caught them. Reports of the number killed outside the city's gates varying significantly from a few dozen to forty or more. Among the killed was Jean Marie Cardinal who was an early trader and explorer of the Mississippi. He and his Pawnee Indian wife, Careche-Caranche had seven children. (Cardinal Avenue in St. Louis is named for him not the Baseball Cardinals). At least one American was also killed in the fields. He was with a Frenchman by the name of Chancellor and his family, riding a horse drawn cart. Chancellor was hit twice by a musketball in his arm, his wife was shot through her hand. The American (name unknown) was shot dead while an elder daughter was hit in the shoulder. Another daughter received a wound to the head. To prevent the Indians from getting the American's scalp, Chancellor hurried the horses through the city gates. Another lucky survivor was Julian Roy. He had gone to the fields armed with a pistol. First trying to outrun the Indians, Roy realized that one was nearly upon him. Using his pistol he fired and shot the Indian in the jaw. Not seeing anyway to escape the onrush of the enemy, Roy cleverly assisted the wounded Indian and winning his appreciation which spared his life.